The2015 Sedona Bridal Show and Boot Camp is coming January 17th to the fabulous Hilton Sedona Resort and Spa from 10:00 to 3:00. Widely recognized as the most stylish and well-attended wedding planning event in Sedona, this is place to be if you’re thinking about having a romantic Sedona wedding. The 2014 show broke all records with hundreds of brides in attendance. Don’t get confused by similar events. The 2015 Sedona Bridal Show and Boot Camp is only at the HILTON SEDONA RESORT AND SPA and is not affiliated with any other Sedona wedding show. The 2015 Sedona Bridal Show and Boot Camp is will be held again at the Hilton Sedona Resort and Spa. Get valuable insider tips from Sedona’s most exclusive vendors and venues, win prizes, meet the vendors, taste great food and cake, get inspired by gorgeous table-top displays and much, much more. Our stylish wedding planning experience is your all-inclusive wedding show with a fabulous twist. Enjoy the following video and see what a treat you are in for! 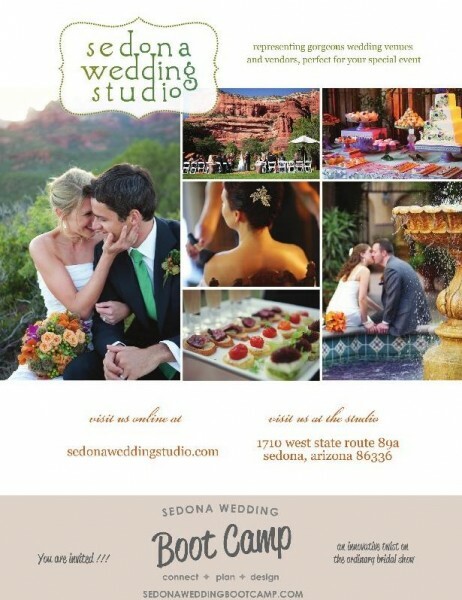 Sedona Wedding Studio + Sedona Wedding Boot Camp from Royal & Design on Vimeo.